Nairobi — Health Services have been paralysed in hospitals within 23 counties as nurses protested delayed allowances and the non-implementation of a Collective Bargaining Agreement (CBA) negotiated in November 2017. In Nairobi, Branch Secretary Nairobi Ediah Muruli stated that they will only return to their work place after the return to work formula is fully implemented. Some of the issues include uniform allowance to be enhanced by Sh5,000 shillings per year, nursing service allowance to be enhanced by a monthly Sh3,000 and promotions. "In Nairobi County, there was a return to work agreement that was signed before the 5-month strike was called off in 2017. This agreement was to be implemented in 2018 from July and up to date, there is nothing that has been done," she stated. 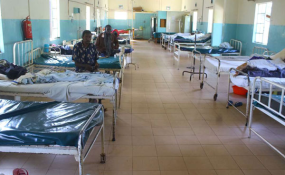 Nurses in Kitui county joined their colleagues and health chief officer Richard Muthoka confirmed that health services in all government hospitals in the county have been paralyzed. The situation was similar in Kisumu where patients were being turned away and the Kenya National Union of Nurses Secretary General Seth Panyako says the strike will continue as planned. He said only Machakos, Mombasa and Migori had honored a Collective Bargaining Agreement signed in November 2017, with three others re-committing to the same. Other counties where nurses did not report to work include West Pokot, Kisii, Taita- Taveta, Nyandarua, Trans Nzoia, Elgeyo Marakwet, Wajir and Nyeri. Labour and Social Protection Cabinet Secretary Ukur Yatani in the meantime has asked the Nurses' union to call off the strike and give way to dialogue. Yatani who spoke during a meeting with a conciliation committee appointed to mediate a stalemate that could cripple the health sector affecting most of the country's population said nurses in the 23 counties should call off the strike as the special committee look into their grievances.